Organisations who actively participated in the Asbestos Awareness Month Campaign were eligible to enter the 2017 Asbestos Awareness Month Campaign Awards dubbed the “Betty Awards”. Below lists the winners of the 2017 Asbestos Awareness Month Campaign. 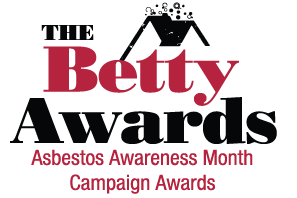 Please note regrettably there there will no Betty Awards for participation in 2018. WorkSafe Tasmania was actively involved in the 2017 Asbestos Awareness Campaign and was integral to the success of Betty’s 2017 Tasmanian Tour. They provided media awareness, ground support with Inspectors who attended Betty events plus promoted the campaign messages through their various social media channels, internal communication outlets to colleagues and staff, WorkSafe Month Events and programmes. TasTAFE actively participated through promoting Betty visits, taking construction students to visit Betty and worked in collaboration with Asbestos Free Tasmania to develop educational resources. Adele was an active champion of the Asbestos Awareness Campaign to her community. She actively promoted awareness to her staff and constituents in the SW WA region throughout November through media, paid advertisements, Information sessions, displays and through promoting the campaign messaging to relevant groups in her community. She focused on Tradies and Families with her activities reaching over 67,500 people in the SW WA Region. South East Asbestos was dedicated to widespread community education during the 2017 Asbestos Awareness campaign. They actively promoted the Asbestos Awareness Campaign resources and messaging across their community through radio placements of the Community Service Announcement, printing banners, holding a Blue Lamington Drive with Community Information Session and raised money for ADRI in addition to conducting media interviews across local radio stations and in social media. Their activities reached in excess of 52,000 people in their community. Winner: Blacktown City Council engaged in multiple campaign activities for the Asbestos Awareness Campaign across owned and earned media and through community engagement activities including social media posts reaching 40,000 people, held two community information sessions in key suburbs with large proportion of fibro homes, ran an Asbestos Awareness Challenge via email to 15,000 registered residents of a sustainability program with 187 participants and held internal Asbestos Awareness training for 16 key staff from Environmental Health and Street Cleaning Teams. Council’s previous activities during the Asbestos Awareness Campaign were limited to digital awareness and poster distribution. Winner: Wollongong consistently builds on their Asbestos Awareness Campaign activities year on year. 2017 incorporated paid radio and print advertising, traditional and social media, outdoor advertising, a strategic DM to households, hardware stores, information session and Blue Lamington Drive at Bunnings. Council demonstrated measureable outcomes through analytics and reached in excess of 250,000 residents in their community. Note: Fiona Netting is the driving force behind such comprehensive awareness activities. Winner: Douglas Shire Council have been involved in the Asbestos Awareness Campaign for three consecutive years and was driven by the Environmental Health Officer. In 2017, Council’s involvement spread into other departments across Council to ensure a broader reach of messaging internally for staff and for the community. Mayoral support ensured the Asbestos Awareness message was a priority for Council and was actioned on by Resource Management, Plumbing/Trade Waste, Planning, CEO Unit and Councillors. Council distributed posters, flyers and information to the general public and key targets through their waste teams. An active digital campaign was undertaken across social and owned media. Winner: Glenorchy City Council undertook an internal and external campaign for the Asbestos Awareness Campaign which included conducting internal training for 70 staff, hosting and actively promoting Betty’s visit through traditional and digital media across owned and earnt platforms with every household in the LGA receiving Asbestos Awareness information via the distribution of a material. Winner: Latrobe Council expanded on their 2016 Asbestos Awareness Campaign activities to incorporate free community asbestos awareness kits which were packed by local high school students after attending an asbestos awareness seminar. An information seminar and Blue Lamington Drive was also held for staff. Council reduced fees for testing and disposal during November and Council reused and expanded their innovative 2016 doll house display to promote the various locations of Asbestos in domestic properties. The council actively promoted Betty’s visit and campaign messages across traditional and social media. Since 2013, Fiona Netting has consistently grown Wollongong City Council’s community engagement programme for asbestos education during the annual Asbestos Awareness Campaign. Annually, Fiona actively obtains grants to run her programmes and activities which have included substantial advertising campaigns across radio, TV and Outdoor (bus backs, bus shelters, banners), community engagement events, direct mail campaigns and Blue Lamington Drives. Fiona has managed internal and external Asbestos Awareness education sessions about residential asbestos and is dedicated to growing Council’s involvement in the campaign each year which has been recognised by receiving 5 Betty Awards starting with a Commended in 2013 to receiving Most Innovative Council and Best Regional NSW Council in 2014 and in 2016 Most Improved and Best NSW Regional Council. Such positive campaign results are only possible because of the dedication of the campaign manager or facilitator, and Fiona has consistently driven council’s outstanding results to benefit the Wollongong community. Jenna Mays went above and beyond what could be reasonably expected in her contribution to the National Asbestos Awareness Campaign through her strategic support of the 2017 Betty 29-day, 4,000 kilometre Tasmanian tour. Jenna played a pivotal role in the tour and ensured WorkSafe Tasmania inspectors were on hand to provide information during every Betty media event (28 over 29 days). Jenna acted as liaison for WorkSafe Tasmania with the Asbestos Awareness Campaign and local organisations including TasTAFE while conducting additional awareness activities to maximise the benefits of Betty’s Tassie tour ensuring increased awareness of asbestos among Tasmanians. Jenna was integral in making Betty’s Tasmanian Tour the most successful tour to date.